200 ml liter Fresh milk – Regular diary milk is good to use. It is better to avoid ultra-pastuerized* (UHT) or ‘lactose-free’. Goat milk if available please use it. Add Kefir Grains to empty glass jar or BPA free plastic jar. Add 200 ml of milk at room temperature to the jar. Do not add milk upto the brim of the jar, leave one or two inch gap for breathing. Give a stir with plastic spoon. Cover the jar with clean cloth and secure with rubber band. Place the mixture in the kitchen top or cabinet or any safe place away from the direct sunlight. After 24 hours (maybe other 12 hours) you can see a thick consistency liquid (sometime bubbles), now it is ready to strain and use it. Use a plastic strainer and spoon to separate the grains and the ready kefir drink. Use the separated grains for next batch of kefir drink in same way. You can also keep the kefir drink in the refrigerator and use it later. Looks like popcorn when rolled, it can be shaped easily. 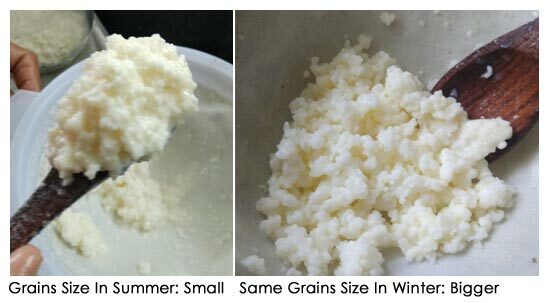 Kefir grain is made from gelatinous white or yellow small granules particles called “grains.” which forms a clump. These grains contain the bacteria/yeast mixture clumped together with casein (milk proteins) and complex sugars. 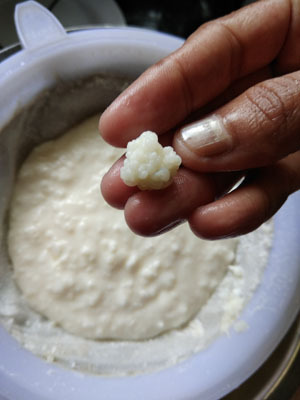 Kefir grains tend to be smaller in size in warmer climate, breaking naturally due to heat but makes rich & creamy kefir as the surface coverage area is more. The growth of the kefir grains in summer are sluggish compared to winter season. The same kefir grains in winter season grow well and joins together forming bigger clump (like cauliflower), thanks to cold temperature. Check best time to consume kefir and how much? Why Kefir Grains are not Multiplying? Looks Smaller in Size?